BRITE Colours Clothing Line, Books, School Supplies, & Home Decor promotes positive images for People of Color from our Black Children to our rising Black Entrepreneurs. BRITE Stands for:Brilliant. Radiant. Intelligent. Talented. Exceptional. "My mission is to remind my people that even with all the negativity and challenges we face in this world, we must never forget that we are BRITE Colours: Brilliant. Radiant. Intelligent. Talented. Exceptional." 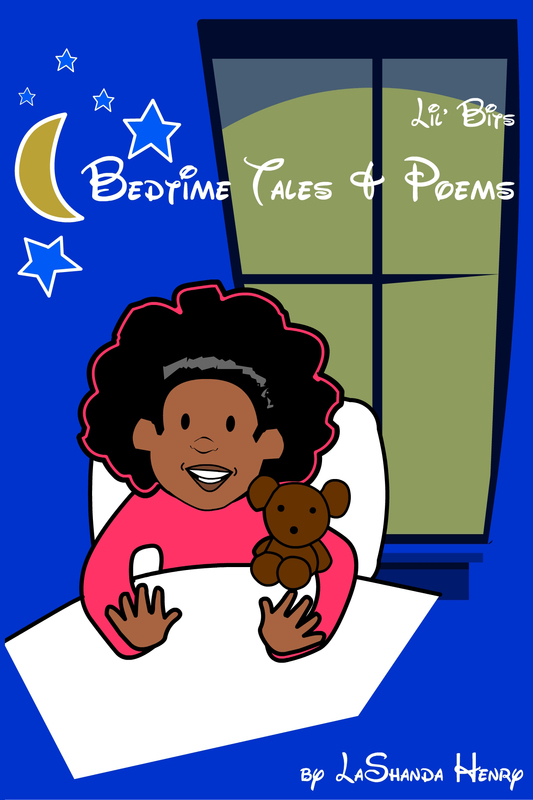 -LaShanda H.
Lil’ Bits Bedtime Tales & Poems is an African American Children’s digital ebook (PDF) featuring poems, prayers, & bedtime stories. It is the first of the Lil’ Bits collection written by LaShanda Henry. This collection features a colorful group of Black Children for you and your child to enjoy.Visit Lil Bit’s Online for more African American Children’s Books & Online Activities. This is a 20 Page PDF eBook Download. Click here to purchase the print book version. Brilliant. Radiant. Intelligent. Talented. Exceptional. Lil’ Bits Kids Collection is a multi-cultural series for all children; designed with Children of Color in mind: African-American Children, Caribbean Children, Black Children, Bi-Racial Children, Hispanic Children. Lil’ Bits Kids Novelty Notebooks and Sketchbooks are produced after ordering. This usually takes 3-5 business days. After production and packaging, orders are shipped. BRITE Colours Creator and Lil’ Bits Kids Designer LaShanda Henry (@sistasense) is the proud owner of a North Carolina Based, Black Owned Business. LaShanda Henry has over 16 years experience creating positive images for People of Color. Some of her websites include Multiple Shades of You Online, the Black Moms Club, SistaSense for Women Entrepreneurs, Black Business Women Online and the black parenting blog. Ms. Henry is passionate about curating and showcasing the amazing accomplishments of people within the African Diaspora across the globe. While instilling a sense of pride among those who enjoy her web creations and products within the BRITE Colours Collection.BRITE Colours Creator and Lil’ Bits Kids Designer LaShanda Henry (@sistasense) is the proud owner of a North Carolina Based, Black Owned Business.